Art can be inspired by many things, but sometimes it just happens. This accidental creation happens many times for Sister Josephine Niemann who works in Liturgical Fabric Arts at Sancta Maria in Ripa in St. Louis. Sister Josephine, who has had two pieces featured in an art gallery displaying an exhibit based on Pope Francis’s encyclical Laudato Sí, frequently creates pieces and then realizes their themes. 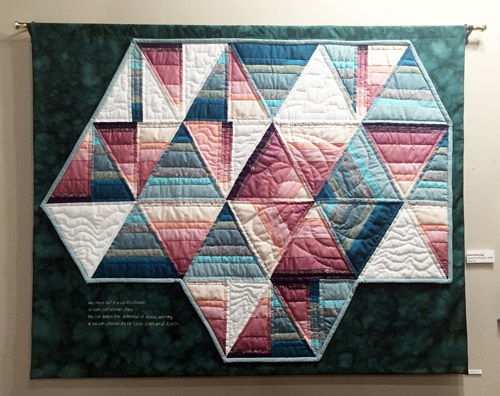 Her two pieces, a quilt with the theme of climate change and a nylon banner with a creation theme, were featured in the Good Shepherd Gallery in north St. Louis County. While the banner was a commissioned piece, the quilt’s theme was one that Sister Josephine did not plan. The phrase, “We have before us dry dessert or rain refreshed fauna. We can ignore the existence of global warming or choose life for future children of Earth,” made the quilt a perfect fit for the gallery’s current show. “We wanted to reach out to sisters around the St. Louis area who we knew held Laudato Sí close to their hearts and who created beautiful works that could tell the story about the past, present and future of our Common Home if we do not do something to change it,” says Sister Glynis Mary McManamon, a Sister of the Good Shepherd who runs the gallery. Sister Josephine’s other piece, a banner focusing on creation, is made from nylon with mosquito netting and features people, animals, the sun, moon and stars. The birds on the banner represent the Holy Spirit. The art was incorporated into the show after Sister Glynis reached out to her looking for works to showcase in the gallery, and Sister Josephine chose these two pieces to exhibit. Sister Josephine, along with Sister Regina Kabayama, have also created quilts based on photos. They created a quilt inspired by a photo of two irises taken at the Missouri Botanical Garden in St. Louis. The sisters are often moved to create these types of pieces by marveling at the beauty of God’s creation. Sisters active in anti-trafficking efforts Human trafficking, also known as trafficking in persons (TIP), is a modern-day form of slavery. Catholic Sisters representing religious congregations based in Wisconsin continue efforts to end human trafficking. Their outreach includes promoting the national human trafficking hotline information via billboards and bus ads Wisconsin-wide. Teaching to a need Finding they had the resources available to help students near Chatawa, Miss., reach expectations, School Sisters of Notre Dame offered their services to help get third-graders to the level that allowed them to be advanced to fourth grade.